Torval is found in the southern-half of Elsweyr known as Pellitine, but it is specifically in the western edge of the region of Tenmar Forest. Pellitine is known for jungles, rainforests, and river basins. 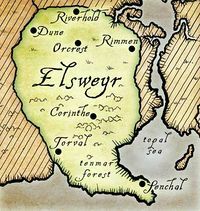 Torval is also found on the western end of the Great Divide, a long stretch of road that spans across the southern coast of Elsweyr, and bridges one side of the Quin'rawl Peninsula, to the provincial border where Torval is located. The Khajiit that live in Torval are known fisherman, often exploiting the sea and whatever it can provide. In ancient times, they would trade with the former kingdom of Ne Quin-al. Like other areas in Elsweyr, Torval contains a Temple of Two-Moons Dance, with this one, in particular, being known for producing great fighters and excellent training in all of Tamriel. In the area lies the Torval Royal Ochre, a rare and valuable pigment that comes from the aforementioned clay. As mentioned before, the Mane and his tribe live in palaces surrounded by Moon Sugarcane gardens. These palaces are crafted from oak that comes from Valenwood, which is only a few hundred miles away from Torval. The Mane's Warrior Guard patrols the sacred grounds, preventing anyone from entering and disturbing the Mane. Torval is neighbored by several settlements, including Darvulk Haven in the far southeast, and Portneu View in the northeast. Torval's founding is unknown. In the Khajiit's early history, there were sixteen sovereign states that inhabited what is currently known as Elsweyr. One of these kingdoms was Torval, who gained significant power among the other nations when the moons are at quadrature when the twin moons (Masser and Secunda) are in either the first quarter or third quarter. During this time, Torval would often trade their fish and other items from the sea with the northern kingdom of Ne Quin-al, who would offer their warriors in return. In 2E 560, the Knahaten Flu had spread across the province of Elsweyr, beginning from the city-state of Senchal and eventually spread across the province. At the time, the Mane was Akkhuz-ri. The Lord of Torval, as well as, the Speaker of the Mane was Gharesh-ri. Gharesh-ri was essentially the political leader of Elsweyr. Elsweyr would have succumbed to the disease, for not the intervention of the First Aldmeri Dominion. In 2E 580, Lord Gharesh-ri had signed the Elden Accord, joining Elsweyr into the Aldmeri Dominion. Elsweyr was slowly overwhelming the Knahaten Flu. During this time, Lady Radurra-dra of Torval was considered the southwest Elsweyr representative of the Thalmor. In 3E 80, King Mantiarco of Solitude had made a hefty donation to Emperor Uriel Septim II to quell a Khajiiti rebellion in Torval, in exchange for the hand-in-marriage of one of his daughters. This daughter proved to be Potema Septim, who would become a very controversial figure in the history of the Third Empire. Supposedly, Pelagius Septim III was interred into a prison asylum in Torval. During the Imperial Simulacrum in the late Third Era, the city-state of Torval was an active settlement, being ruled by King Mojtabe. It had a rivalry with Corinthe. In 3E 395, midst the Imperial Simulacrum, the Five Year War had begun with the Slaughter of Torval. The details of the event's cause is a discussed topic. The Khajiit claim that the Wood Elves had invaded the city-state of Torval without being provoked, while the Wood Elves claim that the attack was started as retaliation when the Khajiit had assaulted wood caravans on their way into Valenwood. Whatever the story may be, the Wood Elves had killed thousands of people, until they were driven out by a nearby jungle tribe. The conflict continued until in 3E 399. By 3E 432, the drug-smuggling business spearheaded by Ya'Tirrje, the Gold Cat had operated in the city-state of Torval, among other influential1 cities in the province of Elsweyr, mainly through the coastal port-town of Senchal. The name, "Torval" is an alternate version for the name of Topal the Pilot, the Aldmeri explorer that fully-charted the sea-lanes of Tamriel. He was active in the late Merethic Era, when he first documented the cat-demons, which are speculated to be the Ancient Khajiit. This page was last modified on 25 February 2019, at 17:50.